Download our latest treatment menu and prices. Skin Needling is a skin rejuvenation treatment that helps you restore collagen and elastin through a natural healing process. Ultra fine, medical quality needles attached to a needling pen create multiple skin punctures that induce a wound healing response that stimulates new collagen and elastin production. New collagen and elastin improve skin quality and texture, making the skin feel firmer and smoother and help repair acne scars and fine wrinkles. Skin Needling also helps repair stretch marks and surgical scars. Each of the thousands of tiny puncture wounds induces the release of growth factors that begin the process of wound healing. These factors stimulate new collagen and elastin growth in the surrounding skin. New collagen and elastin production is the goal of all skin resurfacing and rejuvenation treatments. 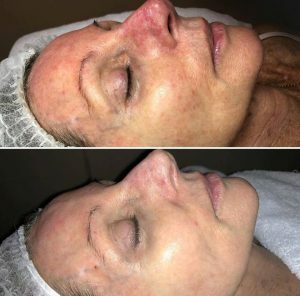 Once initiated, new collagen production can continue for up to 12 months, resulting in an improvement in skin firmness and texture and a softening and lifting of scars and wrinkles. Most importantly Skin Needling involves minimal downtime and is therefore the perfect alternative for those who don’t have time for more intensive laser treatments.